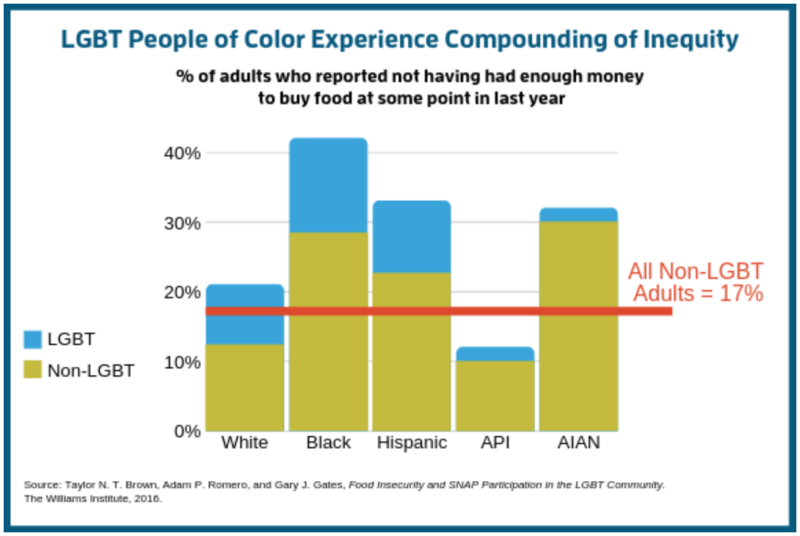 Gay, lesbian, bisexual and transgender (LGBT) adults are 1.6 times more likely to have experienced food insecurity in the last year than non-LGBT adults. USDA’s proposal to eliminate state flexibility to waive punitive and counterproductive time limits on SNAP/CalFresh for unemployed and underemployed people will worsen disparities in food access for LGBTQ+ Americans. The experience of violence, discrimination, and social stigma against LGBTQ+ people limits their ability to access jobs, education, and health care. Within the LGBT community, such experiences are even more common among women, people of color, and transgender, gender non-conforming, and intersex (TGI) people—particularly TGI people of color. Appallingly, more than three-fourths of transgender people have experienced some form of workplace discrimination. The level of LGBTQ+ exclusion varies by geography, and is lower in states with explicit anti-discrimination laws (like California), but disparities in financial, physical, and social well being persist. Protecting access to SNAP is one way we can support the LGBTQ+ community and others facing structural barriers to economic security. Maintaining state flexibility to exempt vulnerable adults facing structural barriers to employment is essential to making the SNAP program responsive to people's economic realities. The USDA proposal is an unwise expansion of a harsh, unfair, and counterproductive policy. Act now to stop this harmful regulation! Submit a comment in opposition to the rule! Download our template comments here. Submit your comments here by April 2nd, 2019. After adding your comment on the rule, encourage at least two people in your network to do the same. Every comment matters! Share this tweet to get the word out!